The perpetrator is something far more subtle, something that you could walk right past without really noticing, something with very inconspicuous, greenish flowering parts. It’s ragweed (Ambrosia spp. 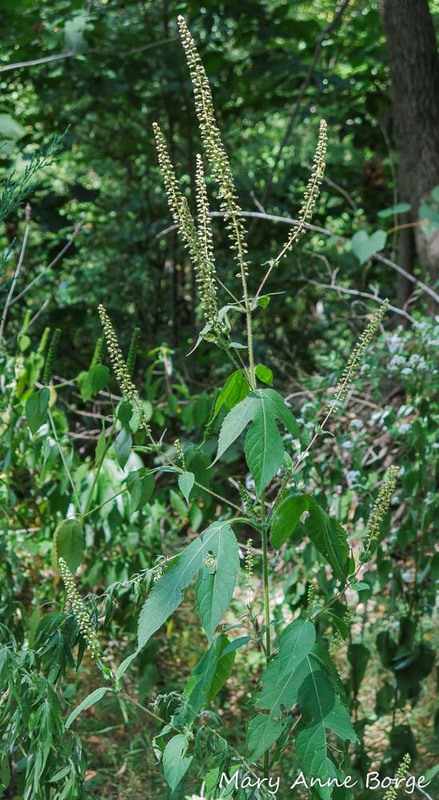 ), one of the plants that have evolved to have very light, small grains of pollen that can be carried readily by the wind. 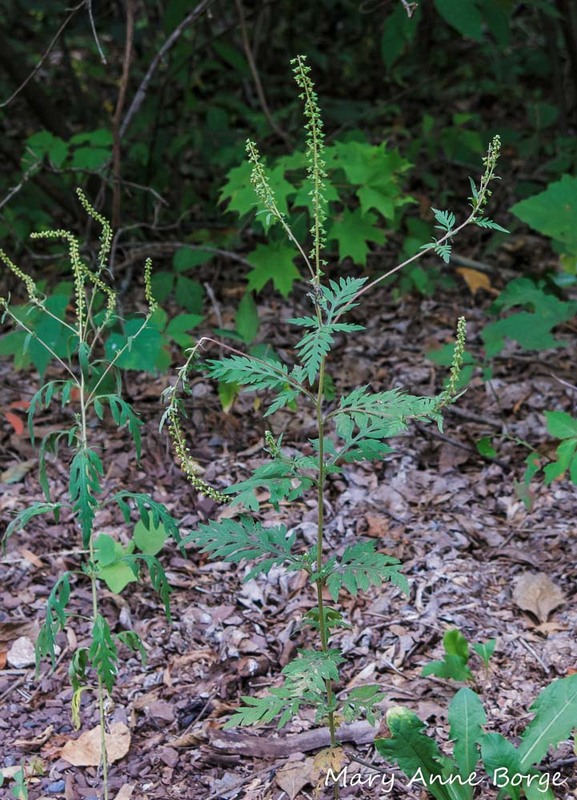 Ragweed’s strategy is to partner with the wind to carry its pollen to another ragweed plant, but those pollen grains are light and mobile enough to travel up your nose or in your eyes if you get in the way. There is no need for showy flowers to entice pollinators, just an aerodynamic pollen design, and easy access to a breeze. Grasses, some trees and other plants share this wind-pollination strategy, and may also cause allergies. It’s worth noting that in spite of their allergy causing potential, Ragweeds have redeeming qualities. They are native plants, and many birds eat their seeds! Plants that have bright showy flowers depend on third party intermediaries to accomplish successful pollination. They have evolved to produce flowers with the colors and food (nectar and pollen) to entice their pollinator partners, some with landing platforms, some that accommodate only hovering visits, depending on who they are trying to attract. Their pollen is heavy and waxy, so that it will stick to the body of the visiting insect, bird, bat or other critter who has come to visit the flower in the hope of finding a meal. The pollen is not designed for flight; it is highly unlikely to be picked up by the wind and find its way up your nose. 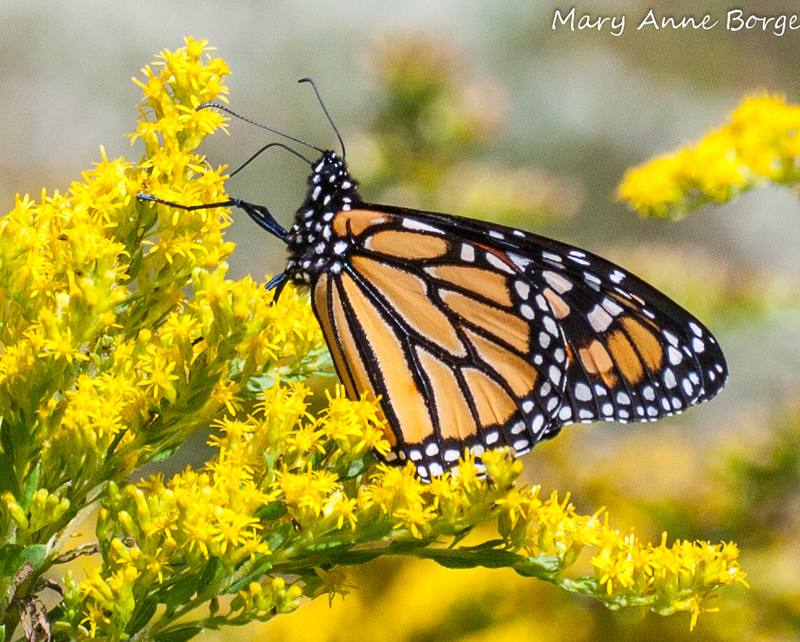 Goldenrods are among the plants that require third party pollinators. They use profuse bright clusters of tiny golden flowers to attract their partners. 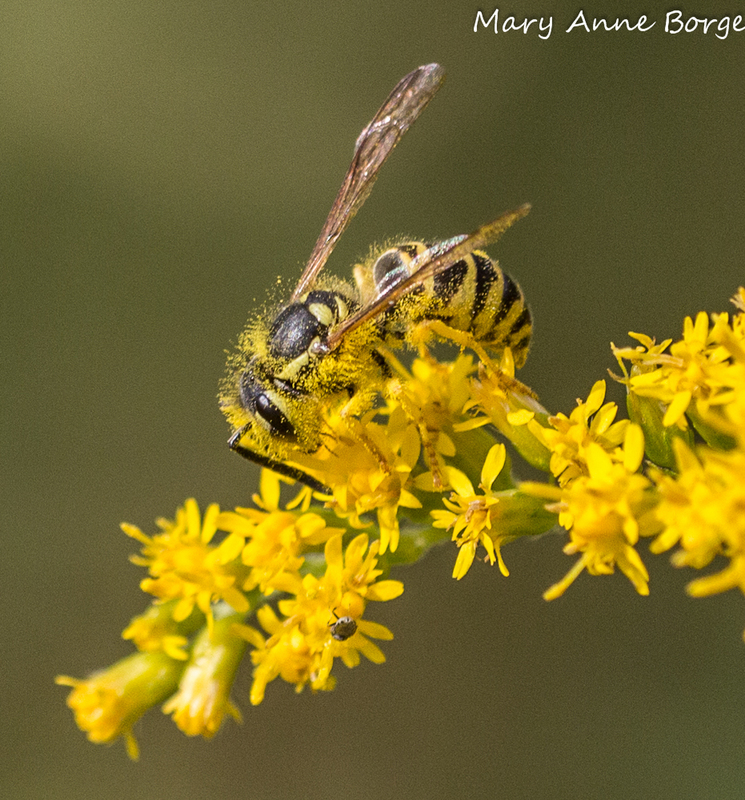 The native bee in the photo below is covered with pollen, demonstrating the effectiveness of goldenrod’s pollination strategy. 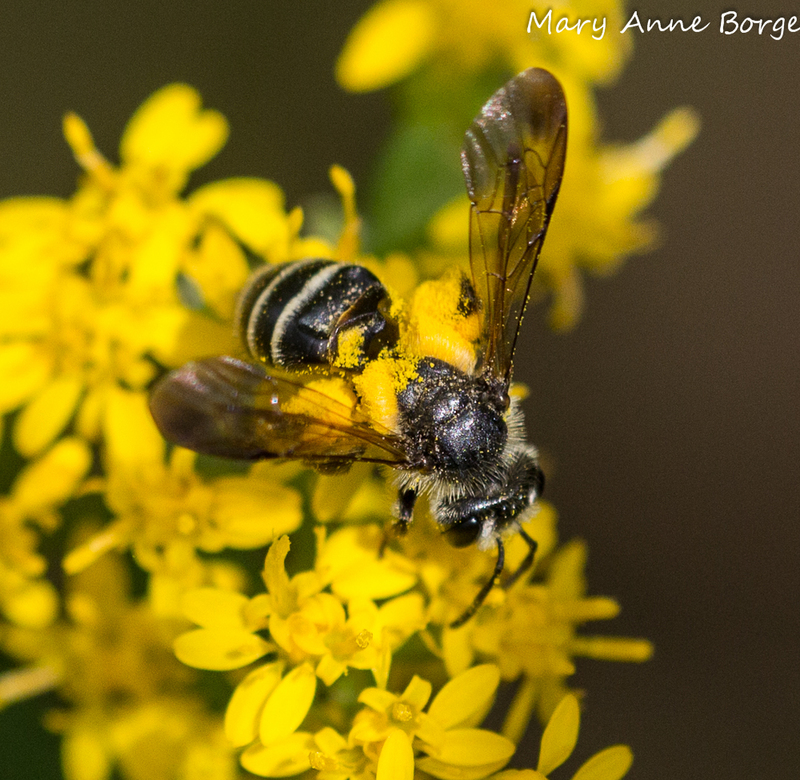 Native Bee on Goldenrod, collecting pollen on its hind legs. 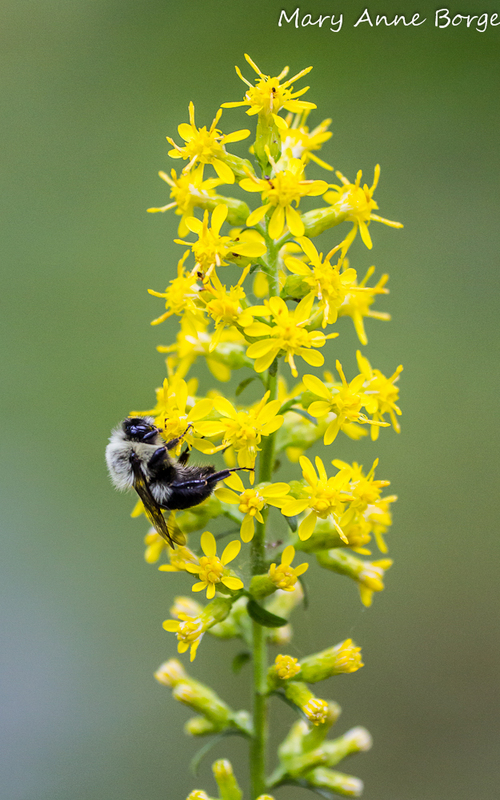 Goldenrods are essential plants, providing food for beneficial insects from mid summer through late fall. 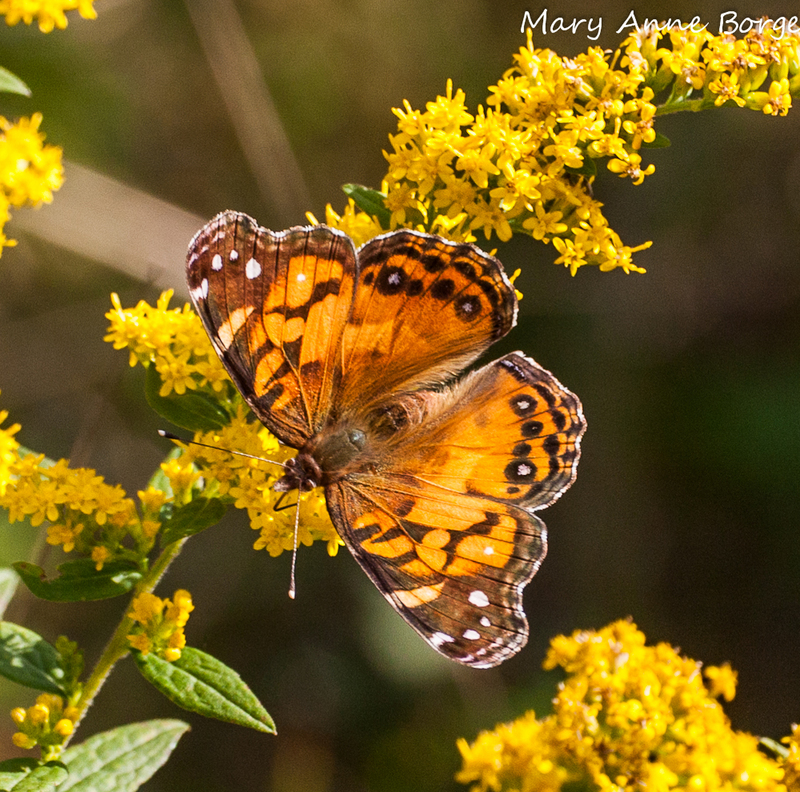 Visitors to the goldenrod banquet include many species of butterflies, bees, wasps, flies and others. 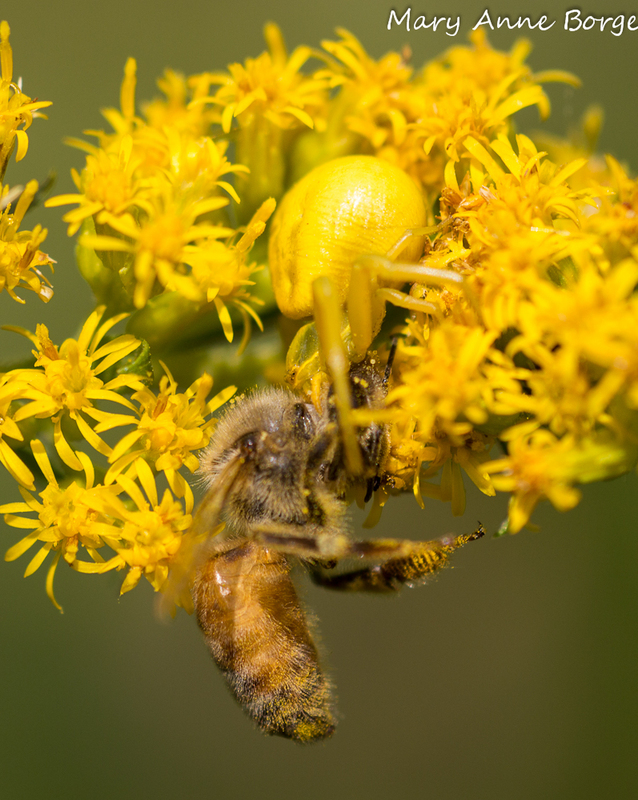 Some of the visiting insects may become a meal for other insects, like the Crab Spider pictured here devouring a bee, or for birds or even mammals. Many species of goldenrods can be found in dry or wet meadows. There are some species that even look great in gardens. Goldenrods that do well in sunny gardens in the northeastern United States include Showy Goldenrod (Solidago speciosa) and Stiff Goldenrod (Solidago rigida), both showing neat, upright spikes of flowers; Grass-leaved Goldenrod, an early blooming species with flat-topped flower clusters, and a variety of Wrinkle-leaved Goldenrod (Solidago rugosa) called ‘Fireworks’, with its flowing cascade of golden inflorescences. 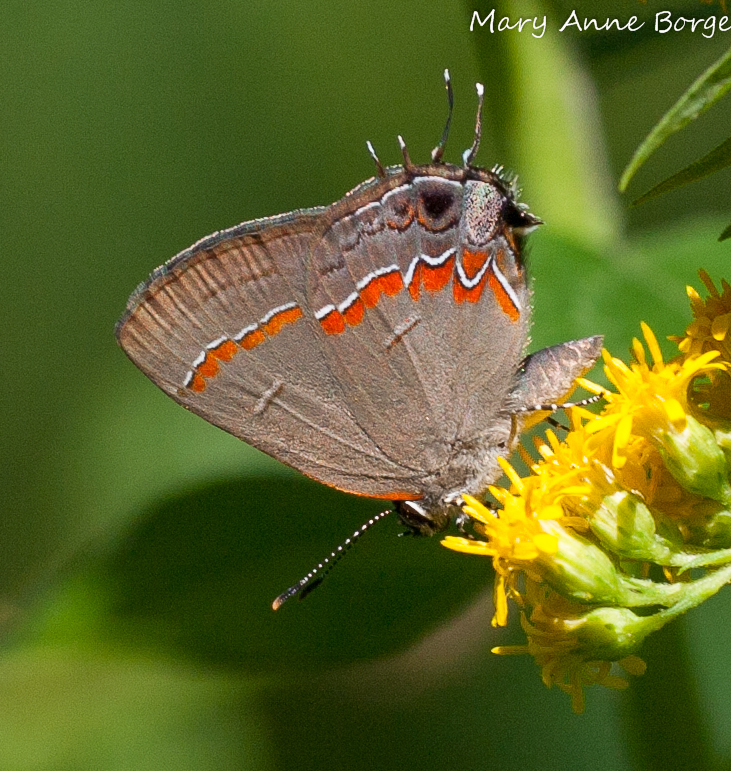 There are even goldenrod species that can be used to light up shade gardens. Wreath or Blue-stemmed Goldenrod (Solidago caesia) has a gracefully arching architecture often seen along woodland paths. 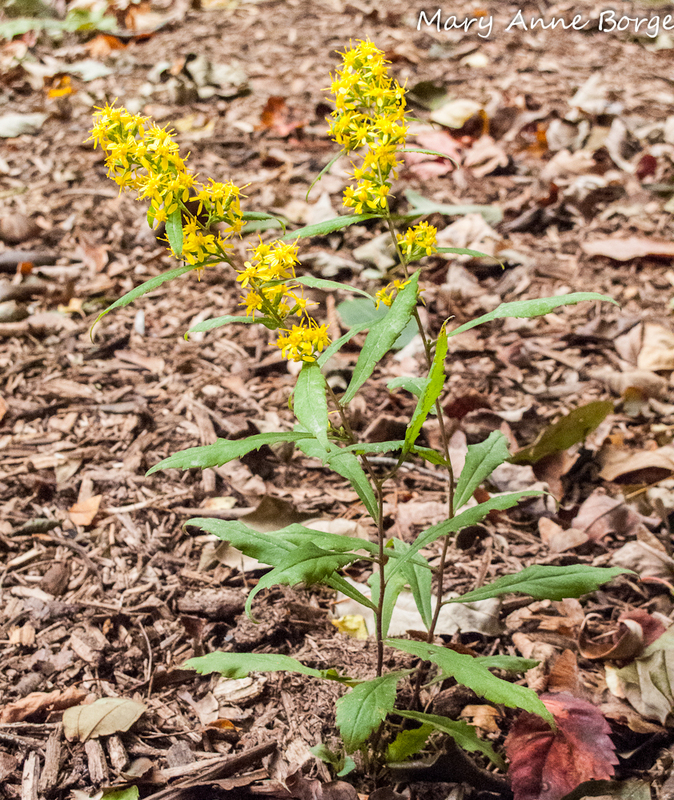 Zigzag Goldenrod (Solidago flexicaulis), true to its name, has a zigzagging stem graced with flower clusters at the top and where the leaves meet the stem. Both of these species do well in shade to part shade. In addition to the value their flowers provide, goldenrods offer food and shelter to hundreds of species of insects, some of which may spend the winter in goldenrod stems or rolled up in leaves. This is a good thing, because both the seeds and the over-wintering insects in turn provide a source of winter food for birds. Watch while hungry sparrows, Chickadees, Goldfinches and even Downy Woodpeckers forage for protein in the form of an insect meal. See below for just a few of the goldenrods’ many visitors. Eastern Yellowjacket (Vespula maculifrons) on Goldenrod. It’s best to avoid close encounters with Yellowjackets, since they may sting. But they serve a very useful role keeping other insects in check. 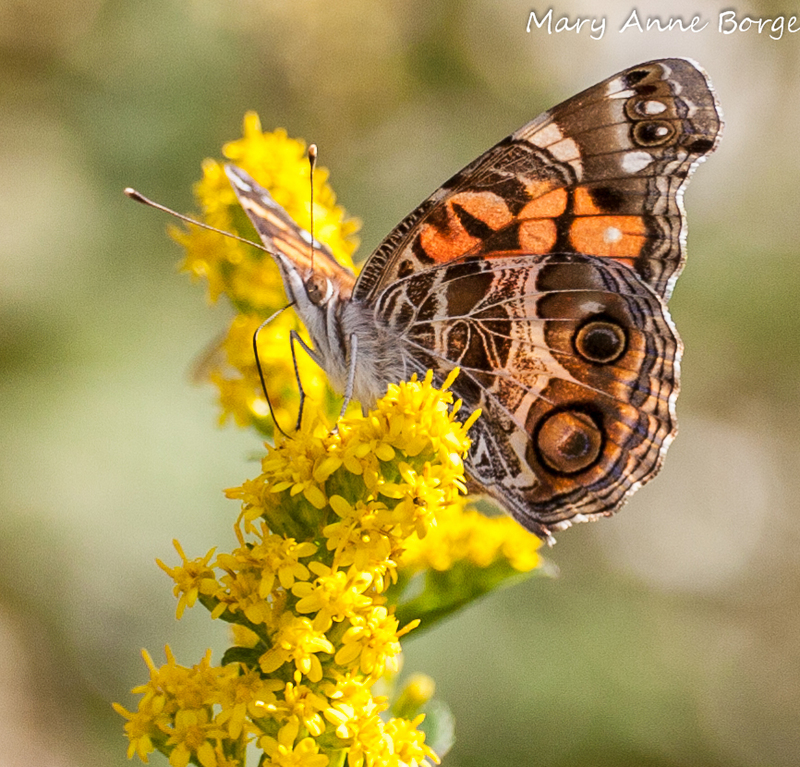 This entry was posted in Butterflies, Gardening for Wildlife, Native Plants, Other Insects and Spiders and tagged American Lady, Fall Allergies, Goldenrod, Monarch butterfly, nature, ragweed, Red-banded Hairstreak, Showy Goldenrod, Wreath Goldenrod by Mary Anne Borge. Bookmark the permalink. Amazing photos and useful information. I know my allergy is to grass pollen and avoided it last year by chance. Was not in Spain or UK when grass pollen was at its height! Sounds like a great way to avoid allergies! Just planted some Goldenrod and Speedwell. I don’t think I ever realized how small ragweed is. Thanks for the info and the beautiful photos, Jeff is right! WOW, another great article with terrific photos.